Plains Lubber Grasshoppers (Brachystola magna) are found in grasslands from the Great Plains south to north central Mexico. Here in Arizona, they are found in the eastern half of the state. In the late summer and fall, grasshoppers of all sorts become abundant in grassland areas here in southeastern Arizona. 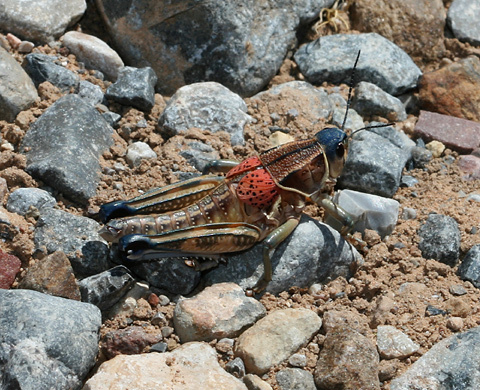 In late August of 2008, I observed this Plains Lubber Grasshopper below and numerous others in the grassy foothills of the Whetstone Mountains near Benson, Arizona. The grasshoppers were so numerous that my every step sent scatterings of them hopping off ahead of me. Since they were obscured by the grass and hopped off whenever I approached, I captured this one in my hand and put it in an open dirt area to get a clear, unobscured photo. Adult Plains Lubber Grasshoppers have a green, blue, or brown head, a striped, bumpy pronotum, and distinctive, small, rounded, pinkish forewings dotted with black spots. 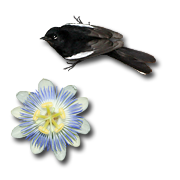 Because of their small, stubby wings, both the males and females are flightless. Plains Lubber Grasshoppers are ground foragers and travel around by walking or hopping. They mostly feed on a wide variety of grasses and other plants, and in some areas, these grasshoppers are occasionally numerous enough to damage crops like cotton. The Plains Lubber Grasshoppers found here in Arizona are notably omnivorous, and besides eating plants, they will also devour any tasty, easy to capture insect that they happen across, including other grasshoppers. This is a feeding characteristic shared with another common Lubber grasshopper found here, the Horse Lubber (Taeniopoda eques). Both of these Lubber species can often be observed crawling across roadways here, sometimes in large numbers.